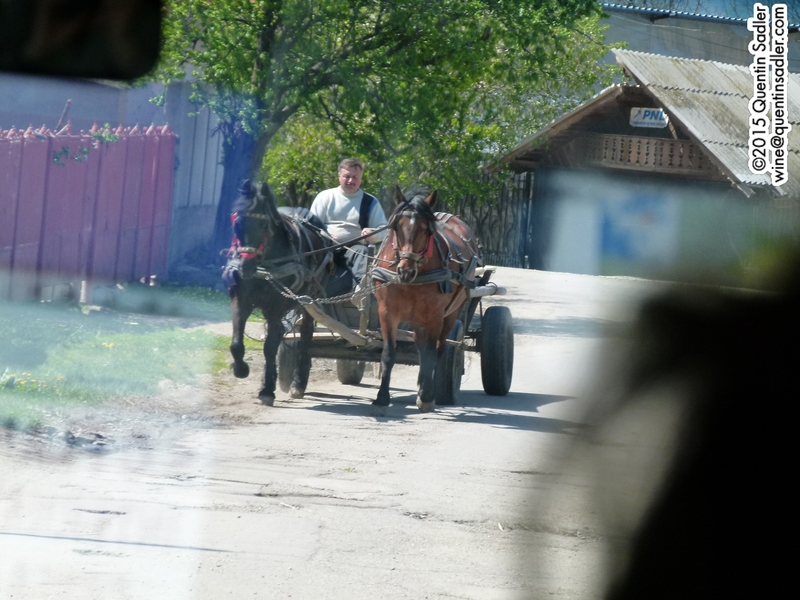 Typical traffic in rural Romania – snapped through the coach window. My visit to Romania last year impressed me very much – and you can read all about it here. I had no idea what to expect at all, not from the country, its culture, food or wines. What I found though was very exciting indeed. The countryside was fantastic, Bucharest a beautiful city and all the wineries that I visited were really passionate people with amazing drive and commitment. What’s more I did not taste a single wine that wasn’t decent and most were much better than that. My only gripe with Romanian wine – and it is aimed at the UK wine trade, not the producers – is that it is very hard to buy the good ones here in the UK. Most stockists carry an affordable range of wines from Romania, you will see that many of the cheapest varietal wines are actually from Romania if you study the label closely. At the top end though it is very hard to find them, so I am really delighted to share this wine with you. I showed it in a tasting of Romanian wines that I tutored for Dulwich Wine Society the other week and it was one of the favourites on the night. It was a wonderful tasting, although I say so myself, what’s more it was 23 years to the day since I had first appeared at Dulwich – that can make you feel old you know. Just as on my trip to Romania, all the wines found favour, indeed they all went down very well with the tasters and I will mention more of them over the coming weeks. In a tight field though, this lovely wine stood out just a little, as not only was it delicious, but it is also available to buy, which many of the others were not. I loved it so much that I have made it my Wine of the Week. 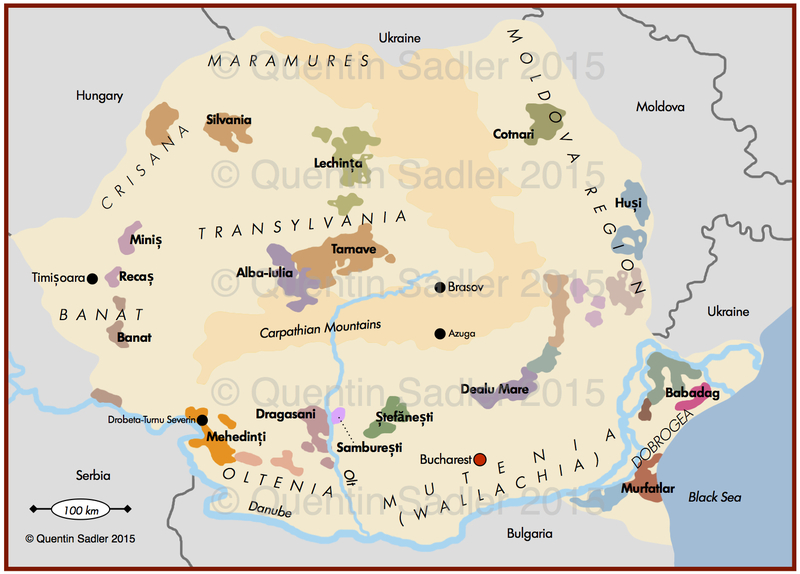 Sketch wine map of Romania – click for a larger view – non watermarked PDF versions are available by agreement. Baroness Ileana Kripp of Prince Ştirbey. The Ştirbey estate is in the south of the country – about 130 km West of Bucharest – on a narrow ridge overlooking the River Olt. The estate has a long history that goes back over 300 years and their wines were considered to be some of the country’s finest in the nineteenth and first half of the twentieth centuries. They were even available in the dining car of the Orient Express during that golden age and they still have some fascinating advertising material from the 1910s and 1920s. The estate was nationalised by the post-war Communist government, but in 1999 Baroness Ileana Kripp, the great-granddaughter of Prince Barbu Ştirbey, together with her Austrian lawyer husband, Baron Jakob Kripp, set about reclaiming her family’s long lost property. They were successful and by 2001 were producing wine, with the help of Oliver Bauer a modest and jovial winemaker from Württemberg in Germany. Today they farm 25 hectares and produce around 100,000 bottles. I like their wines – they make a particularly fine traditional method sparkling wine from the indigenous Crâmpoşie Selecționată grape. It is called Prince Ştirbey Vin Spumant Extrabrut and is available from company in Germany – click here. My Wine of the Week though is their fine Negru de Drăgășani. As its name might imply, this grape comes from this region of Romania and is a crossing of Negru Vartos, indigenous to southern Romania, and the Saperavi from Georgia. The grapes were handpicked, carefully selected and then de-stemmed before being fermented in stainless steel tanks. It was then aged for 12 month in 300 litre Romanian oak barrels. The colour is gorgeous, like freshly crushed blueberries, while the nose is aromatic and intensely fruity with a soft spice and gentle smoke. The palate is rich and concentrated, bursting with ripe blackberry, cherry and blueberry fruit. There is spice here too, black pepper and something softer and exotic like clove. There is some nice freshness that makes the wine feel very balanced, while the tannins are really velvety and smooth, which gives the wine an almost creamy feel. In many ways this reminds me of a very fine and ambitious Barbera and gives us a relatively rare chance to try a top-end Romanian wind – 91/100 points. Try this with charcuterie – Romanians eat a lot of things like that – and with rich warming casseroles, even spicy chilli con carne would work. Available in the UK at £14.50 per bottle from Oddbins. There are not many reasons to be cheerful in the UK right now, so it is good that I am really excited by this week’s Wine of the Week, for 3 very good reasons. Firstly there are 2 of them, 2 Wines of the Week, a red and a white, so something for everyone. Secondly they come from Romania and I was very, very excited by my recent trip to Romania as the wines were so good. Thirdly they are marketed in a really interesting way that might, just might, start making consumers more adventurous about wine. Fourthly (darn, there were four reasons) they are really nice wines. Fifthly (don’t you hate it when that happens, quite puts you off your stride) they are great value for money. Both the wines come from Cramele Recaș, which is an excellent, modern and forward looking winery in western Romania, almost Transylvania in fact. Englishman Philip Cox is the driving force here, although he has an Australian and a Spanish winemaker too, and the focus is to make superb vale wines that over deliver at Low price points – although they make some very good premium wines too. Also they both come from Asda’s new Wine Atlas range which is potentially a very exciting way of marketing wine. Asda are convinced that the consumer is ready for new things and new flavours, wines made from unusual grape varieties in out of the way places and that is what the Wine Atlas wines offer. The range is very interesting and as well as my two Wines of the Week it includes a Sicilian Grillo and Cattaratto, a French Marsanne and a Hungarian Furmint among the whites. As for the reds there is an attractive Marzemino from northern Italy, a smooth and fruity Frappato from Sicily and a very nice Saint-Chinian from the Languedoc region of France. Philip Cox, Commercial Director, Cramele Recaș. The labels are quite funky, flamboyant and colourful and are based on those lovely old travel posters from the 1920s and the sorts of labels we used to see stuck on suitcases and steamer trunks. I hope the idea works and helps Asda’s customers to drink things other than boring old Pinot Grigio and Sauvignon Blanc. Fetească Regală (it means Royal Maiden) is an indigenous Romanian grape and was created by a natural crossing of Fetească Alba and Grasa de Cotnari. I have only tried two examples, but it seems to be a very attractive grape, lightly aromatic, fruity and fresh. This particular Fetească Regală is made to be light, bright and lively, without any oak. The nose is gently aromatic with floral, lemon and light peach notes. The palate is very fresh with soft acidity, so it is not tart, but it is lively, with peachy and apricot fruit and a touch of creamy roundness too. A nice, straightforward and very drinkable dry white wine – 86/100 points. Available in the UK from Asda and Asda Wine Shop for £5.97 a bottle. Fetească Neagră (means Black Maiden) is another indigenous Romanian grape and is the country’s main black grape. Again I do not suppose that I have tasted enough to really know what the grape is like, but I like what I have tried. In style the wines are something like Grenache, but with a bit more tannin and some of the silky quality of Pinot Noir. The nose is bright and lively with plum, strawberry and cranberry n toes together with a little smoke and savoury herbs. The palate is relatively light, juicy, soft and ripe, with succulent red fruit, especially plum and strawberry, light chalky tannins and freshness giving some structure and elegance. There is also a dusting of pepper and savoury, herbal characters- 87/100 points. These are both well made and interesting everyday drinking wines. If you never tried Romanian wines before then these might well be a good place to start. Let me know what you think. Like many of us, a huge part of the pleasure I take in wine is discovering new things. New regions and new grape varieties always excite for me. 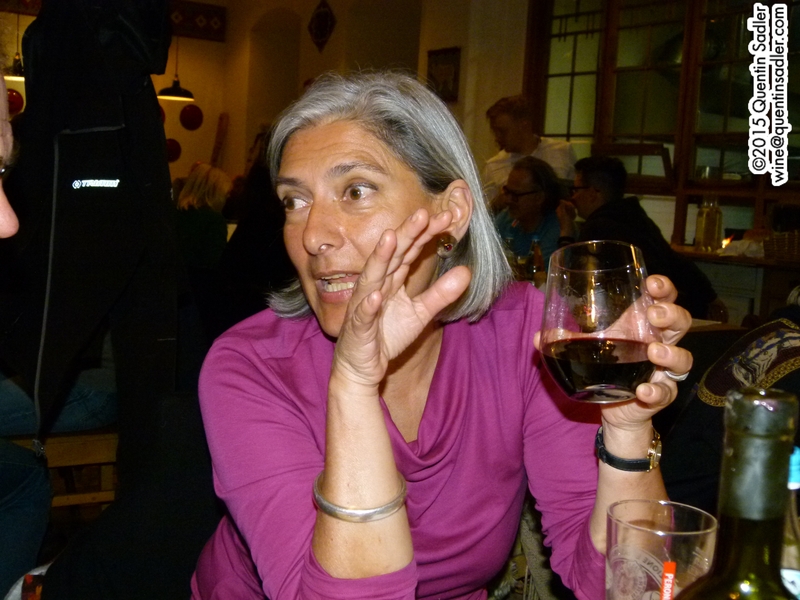 So when the chance came to go on a trip to Romania as a guest of the Romanian Winegrowers, with fellow wine educators and writers, I jumped at it. From what I saw Romania is a very rural country and it often seemed like stepping back in time 40 years. Most of the places that we passed through seemed to provide little more than subsistence farming for the local people. Of course for an outsider there is a huge charm in that. Within seconds of stepping outside our hotel on the first morning I had seen my first horse and cart and almost every house had a clutch of chickens pecking away outside on the grassy verge. We travelled vast distances and most of the time we were on small country roads whose surface was not always of the best and even disappeared every now and again. 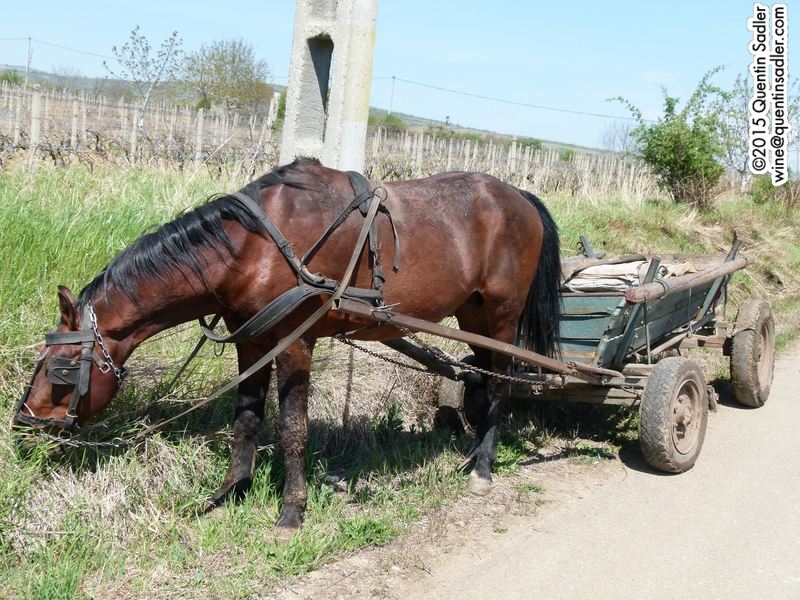 Typical transport in the countryside. 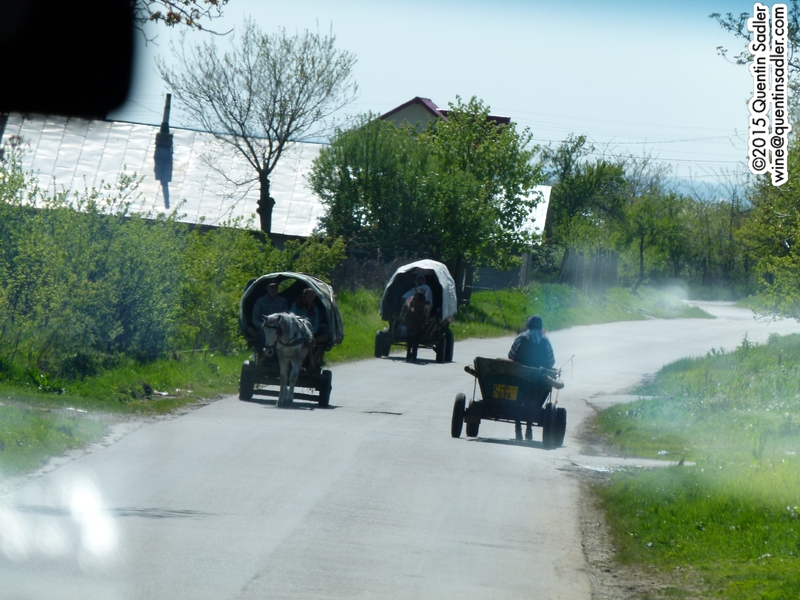 Romanian traffic in the countryside – taken through the windscreen of our coach. Although we do not see that many Romanian wines on UK supermarket shelves, although there are more than you realise, the country has great potential and actually has more vineyards than any other Eastern European country. What’s more because of their Latin roots, and unlike the neighbouring Bulgarians and Hungarians, Romanians actually drink a lot of wine as well as make it. In fact it is still normal for Romanians to make their own wine at home either from grapes they grow themselves, or buy from vineyards. Romania is roughly at the same latitude as France and the climate is continental, except for the grape growing area near the Black Sea, where the hot summers and cold winters are tempered by the maritime influence. The first visit was to the Recaș Cellar near Timișoara in the far west of the country. 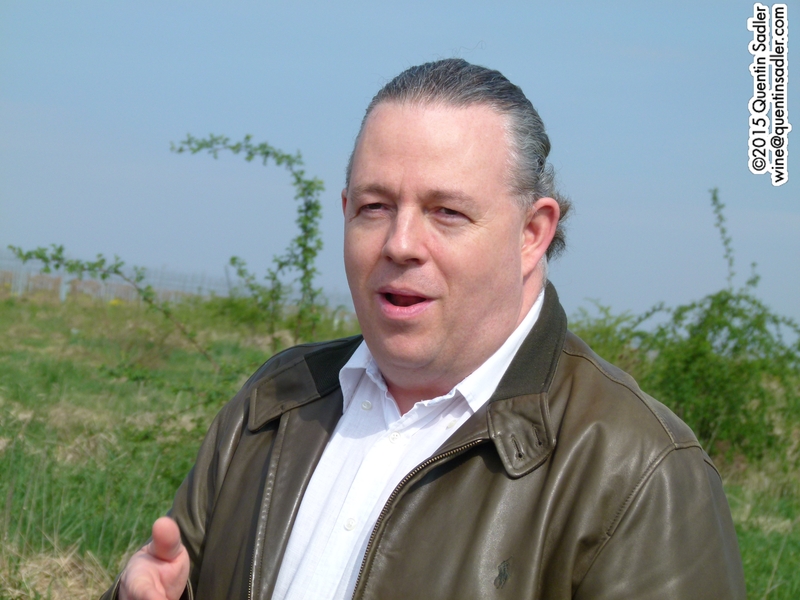 Recaș is run by Englishman Philip Cox who has lived in Romania since 1992 and he and some partners bought the local state cooperative in 1999. He had actually started out as the Romanian importer of Heineken, which was very successful. However he was unable to change the currency into something more useful, so hit upon a scheme of producing wine in Romania that he could export for hard currency. 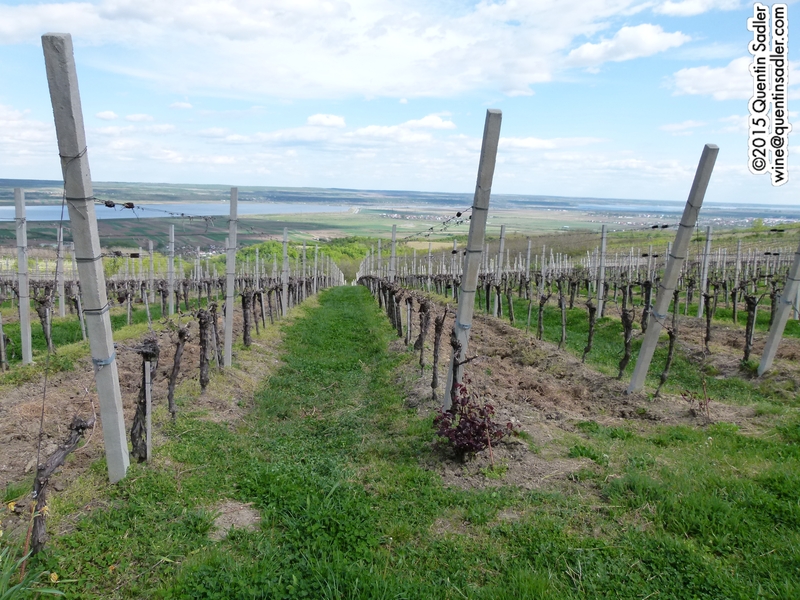 Originally they started with 600 hectares and now farm around 1000, which makes them a very big player in Romania, where many of the producers are much smaller estates. 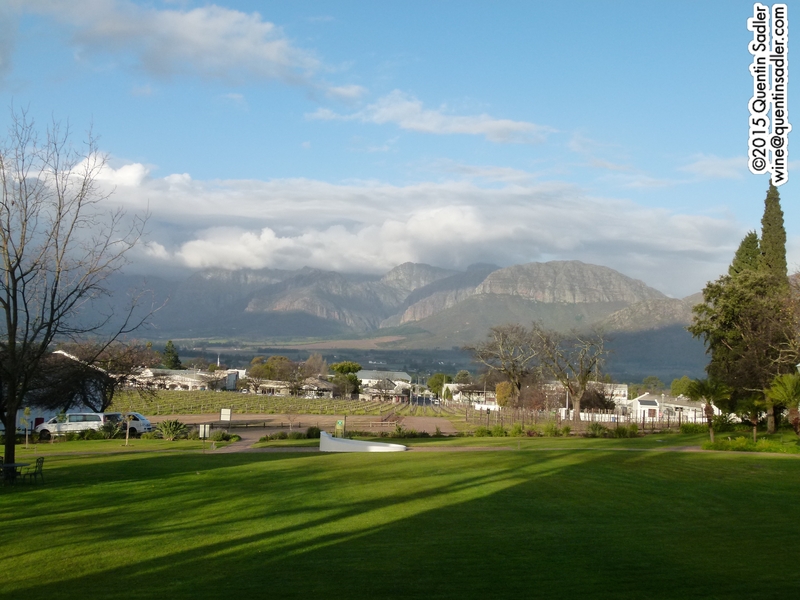 Legend has it that Bacchus spent his childhood in this region and there is evidence of grape growing here going back to Roman times and vineyards were thriving here in 1447, so the area’s potential has long been recognised. Philip aims to make clean, well made, fruit driven wines that sell and as such he provides a perfect introduction to modern Romanian wines. What’s more they are widely available in the UK under a plethora of labels; Bradshaw and Wine Atlas in Asda, Lautarul in Marks and Spencer, Sole in Waitrose and the widely seen Paparuda amongst many, many others. All the Recaș wines are very drinkable and the visit gave me my first ever taste of some of Romania’s indigenous grapes. I enjoyed the citric Fetească Regală (Royal Maiden) and the first of many cherry and plum rich wines made from Fetească Neagră (Black Maiden). They also produce some very good premium wines at Recaș and their Solo Quinta, a white blend based on Chardonnay (the 2014 also includes little dollops of Fetească Regală, Muscat Ottonel, Sauvignon Blanc and even Cabernet Franc) is a delicious and attractively aromatic white that well deserves its £12 price tag from Tanners. Similarly I was impressed by their Cuvée Überland, which is a wine from a single vineyard site – German names are common round here, as long ago the Hapsburgs recruited Saxon settlers to guard this distant border of their empire. They left after the Second World War, but until then the area had been mainly German, or Schwab and the Überland hill was the most prized site for wine production. Made predominantly from Cabernet Sauvignon with some Merlot and Fetească Neagră, the ripe grapes are dried for 2-3 weeks on the vine to concentrate the sugars. The result is a deliciously intense wine that carries its 15% alcohol very well. That night we stayed in a renovated Communist era hotel by the banks of the Danube in the small city of Drobeta-Turnu Severin. It was like going back in time to the 1970s when the Cold War was at its height. Despite being on the drinks menu, the concept of a gin and tonic seemed alien to them, luckily the local Timisoreana beer was very good indeed. Once we sat down in the restaurant, we were handed menus and were all happily choosing what we wanted to eat when the waiters started bring out our unordered food! The whole evening was so reminiscent of the 1970s that it felt like a live version of Rates of Exchange, Ray Bradbury’s comic masterpiece set in a fictional Eastern European country called Slaka. 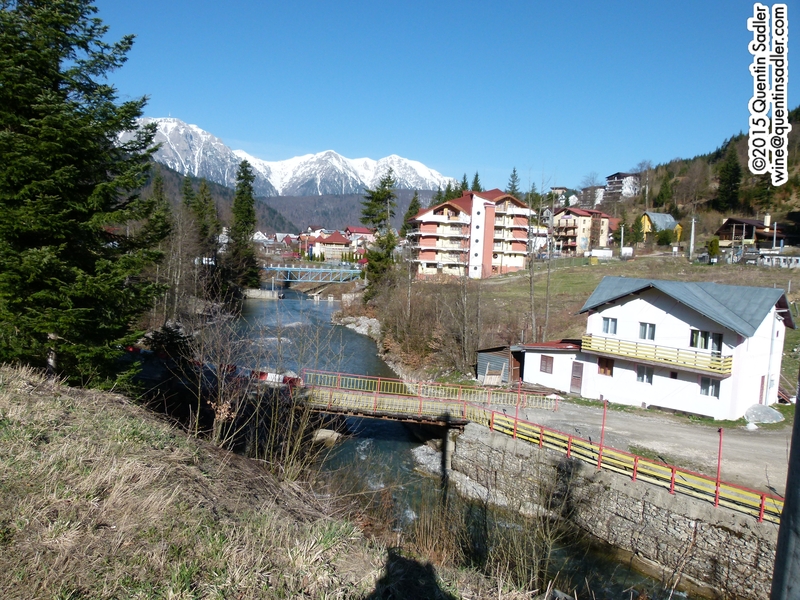 The next morning we visited Corcova in the Mehedinți region. This is a boutique winery 30 km or so from the Danube down in a valley, while its 60 hectares of vineyards occupy the nearby slopes. Like everyone else we visited, Corcova had entirely replanted all the vineyards they bought from the government, as the Communist era plantings were not considered to be good quality and they want to plant with higher density than was common in the 1940s. The winery here is rather lovely as it was built in 1915 with amazing concrete tanks that are integral in the design and so cannot be removed, they have therefore renovated them and brought them back in to use. Rather astonishingly the tanks were installed and the winery was built by an Austrian firm, which just goes to show that commerce continued even when people were fighting ‘the war to end all wars’. These tanks are very thick, which controls the temperature perfectly without the need for refrigeration. Robert Marshall (left) and Şerban Dâmboviceanu (right) of Corcova. Around here, in the south west of the country, there is a slight Mediterranean influence, which helps with ripeness and enables them to have success with Syrah. Everything is very modern and impressive, with a commitment to work in the vineyard that echoed the property’s past. 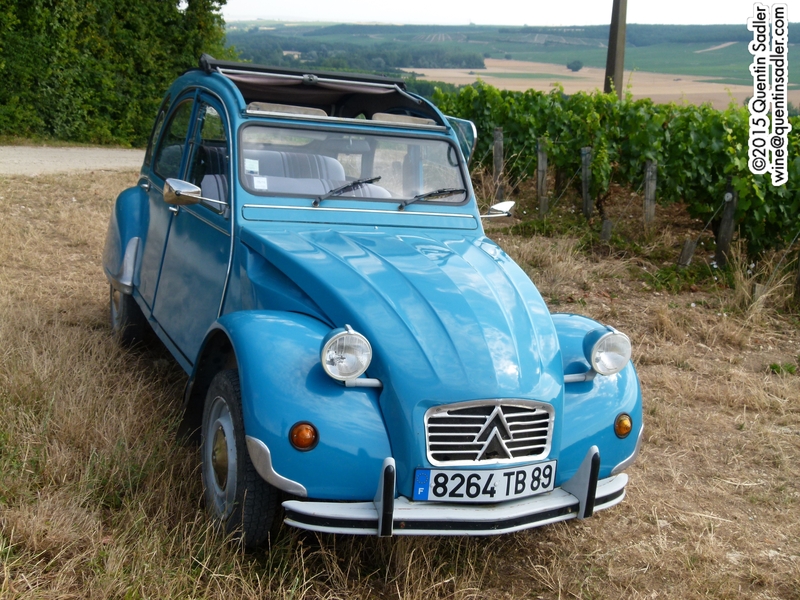 Back in 1907 the original owner had employed a winemaker from Alsace and today they have Laurent Pfeffer, a French wine maker with a somewhat Germanic name. 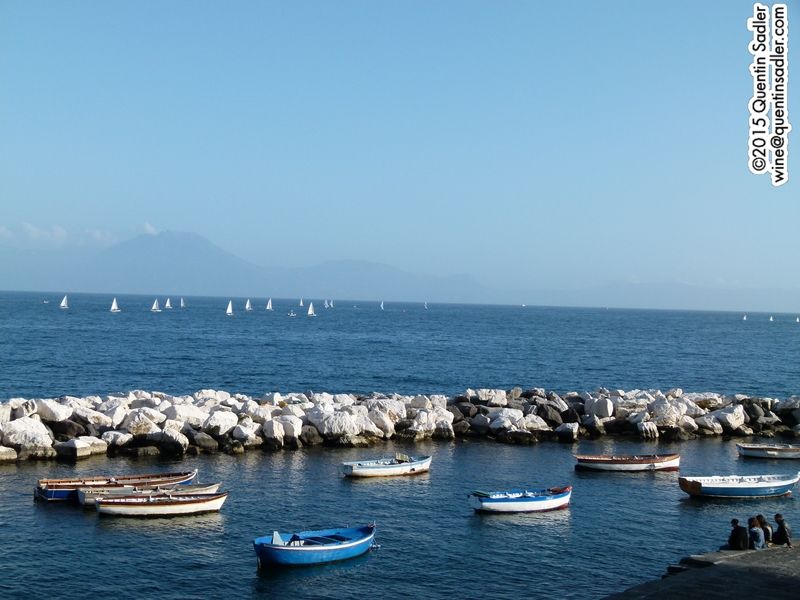 Everything is done here to produce subtle, but concentrated wines. Viticulture is very carefully done, but stops short of being organic and they only use the indigenous yeast for their fermentations. The focus is on international grape varieties, although they also produce Fetească Neagră. I was completely bowled over by the wines, they are of a very high standard, especially their excellent, very elegant and restrained Chardonnay, Syrah and Cabernet-Merlot, while their late harvest Sauvignon was the best sweet wine we had in Romania. These are fine wines, so I cannot understand why UK agents are not beating a path to their door – they are missing a trick. 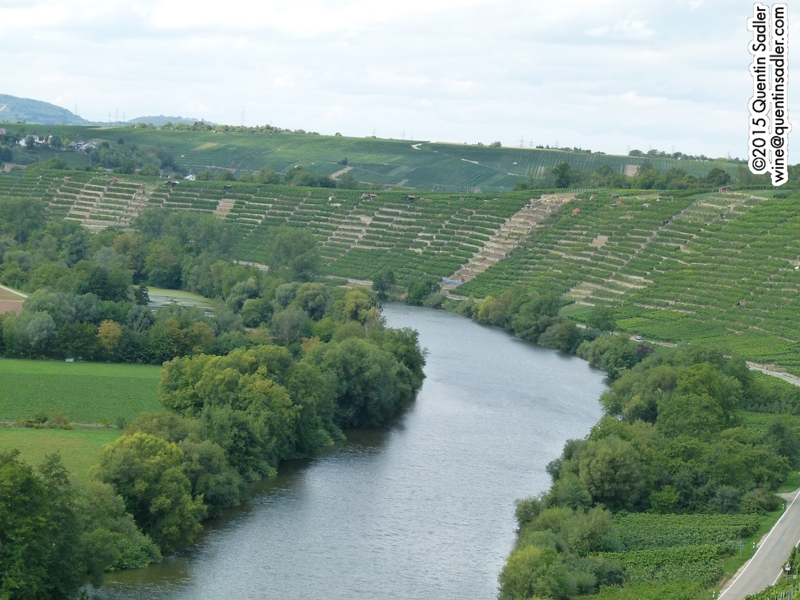 Vines overlooking the River Olt at Ştirbey. 30 km or so further east found us in the Dragasani region climbing a narrow ridge overlooking the River Olt. Here we were visiting the Ştirbey estate whose story goes back over 300 years and whose wines were considered to be some of the country’s finest in the nineteenth and first half of the twentieth centuries – they still have some fascinating advertising material from the 1910s and 1920s. Baron Jakob Kripp of Prince Ştirbey. From 1873 to 1946 it enjoyed particular success under the control of Prince Barbu Ştirbey. His daughter, Princess Maria Stirbey, inherited the estate shortly before the new Communistic regime nationalised it and the family fled to Austria. Then in 1999 her granddaughter, Baroness Ileana Kripp, rediscovered the property and together with her Austrian lawyer husband, Baron Jakob Kripp, set about reclaiming her family’s long lost property. They were successful and by 2001 were producing wine, with the help of Oliver Bauer a modest and jovial winemaker from Germany. They are a charming couple who entertained us wonderfully and accompanied us to dinner in Bucharest the following evening. 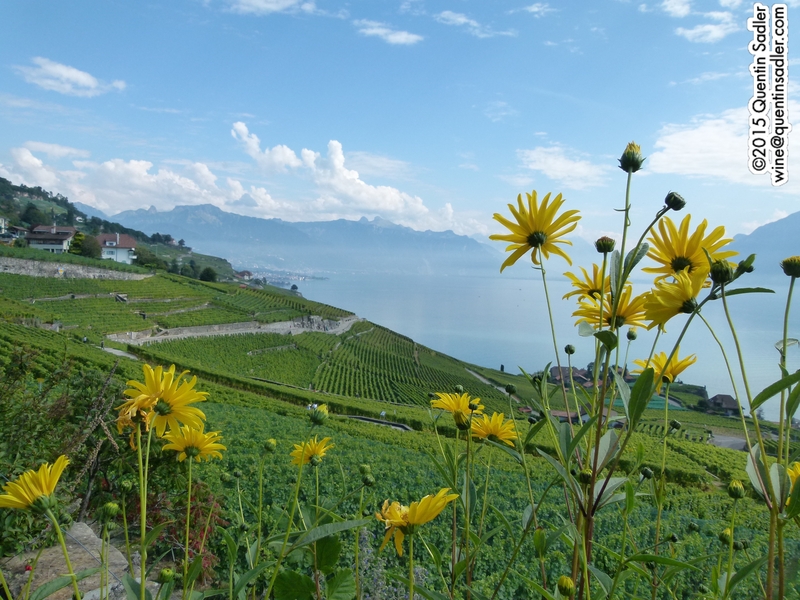 The vineyards are immaculate and the views down the slopes to the river are breathtaking. It all comes together in excellent quality wines, mostly made from local grapes and some of which are stocked by The Wine Society and Oddbins. I enjoyed their aromatic, dry Tămâioasă Românească (a local Muscat) and their richly fruity red Negru de Dragasani Rezerva. Excitingly they are the only producer in the world to offer a single varietal Novak, and very good it is too. 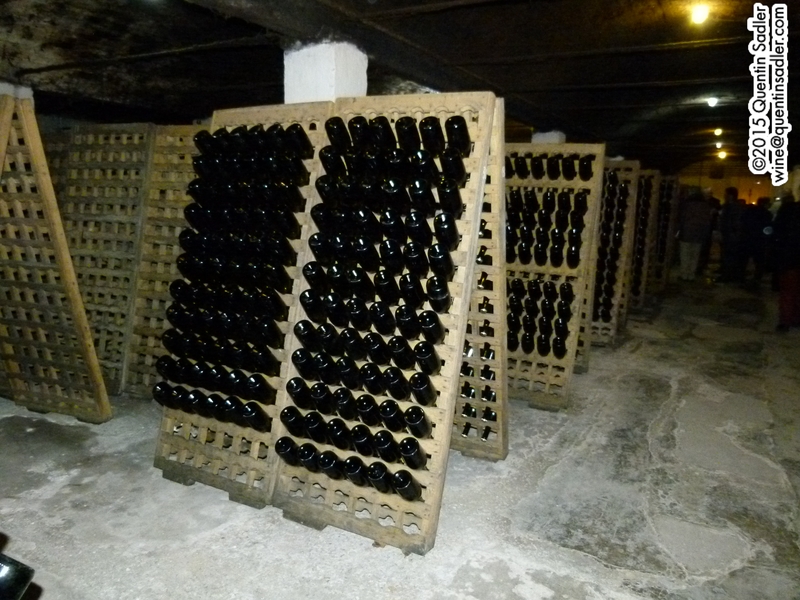 They also produce a field blend of Novak and Negru de Dragasani called Cuvée Genius Loci. The real excitement though came from the Crâmpoşie grape which only grows in this part of Romania. Ştirbey put it to good use, making a delicately creamy still white called Crâmpoşie Selecționată and a very fine traditional method sparkling version called Prince Ştirbey Vin Spumant Extrabrut. It spends about two years on the lees, is riddled by hand and has no dosage at all – try it if you can, it is world class. A big range of Prince Ştirbey wines is available through their German importer, Wein-Bastion. On the way to Bucharest the next morning we stopped at the Vinarte winery. They were established in 1998 by buying vineyards and former cooperative facilities from the government. They farm 350 hectares or so spread over three estates in different parts of the country, but we were visiting the one at Samburești some 100 km north west of Bucharest. The vineyard is 60 hectares and forms a sort of lieu-dit called Castel Bolovanu. It enjoys a south east facing slope at about 260-300 metres above sea level and whilst we stood there we could certainly feel the cool breezes. Justin Uruco handing out cask samples. 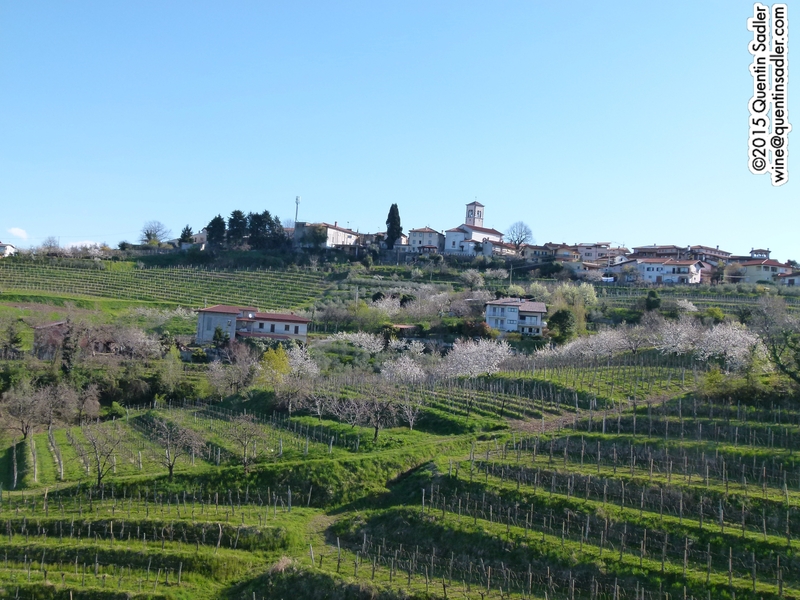 Although Vinarte is a large producer, at this site they only craft two premium wines, the Soare Cabernet Sauvignon and the second wine of the estate, Castel Bolocanu Cabernet Sauvignon. We tasted cask samples of the 2013 Cabernet Sauvignon that had been aged in Romanian oak and in French oak barrels. It was marked how the Romanian oak delivered intense mocha and cherry chocolate characters, whilst the French was more delicate and restrained with subtle vanilla. The finished wines are a blend of the two. The chief winemaker here is a very nice Italian called Justin Uruco, who clearly knows his stuff as these are well crafted wines with excellent concentration. I had been peering at the labels all trip trying to understand the appellation system and Justin was able to explain it perfectly. Most of the wines we had seen had DOC / Denumire de Origine Controlată staus which specifies the geography of where a wine originates. So you might have a wine labelled as being a DOC Recaș or DOC Dealu Mare. There were other letters after the DOC as well though, as in Romania they not only control the geography, like an appellation, but the sugar in the grapes at harvest, similar to Germany’s Prädikatswein system and that is what these additional letters refer to. DOC – CMD is made from fully ripe grapes, DOC – CT is from late harvest grapes and DOC – CIB is from late harvest grapes with noble rot. That afternoon we briefly stopped on our way into Bucaharest to see the enormous Palace of Parliament. 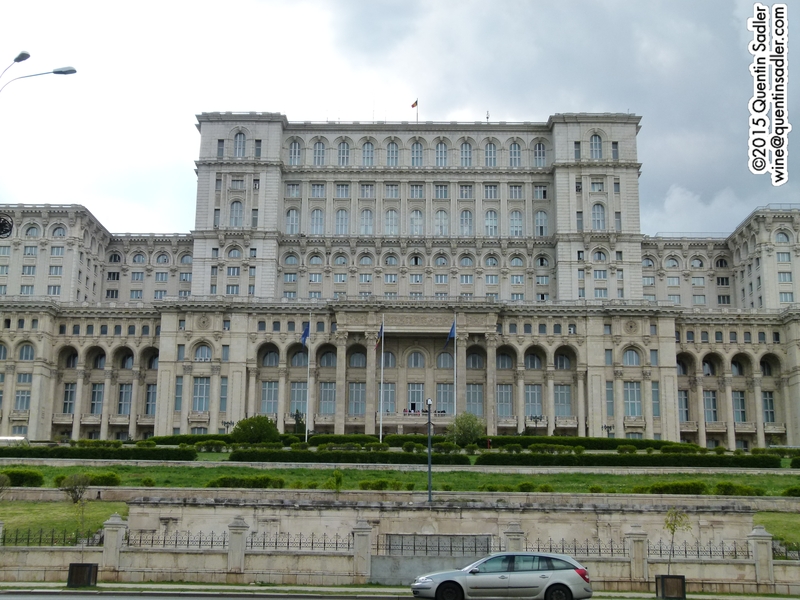 This is the second largest building on earth after The Pentagon and was originally named the People’s House (Casa Poporului) by Nicolae Ceaușescu. 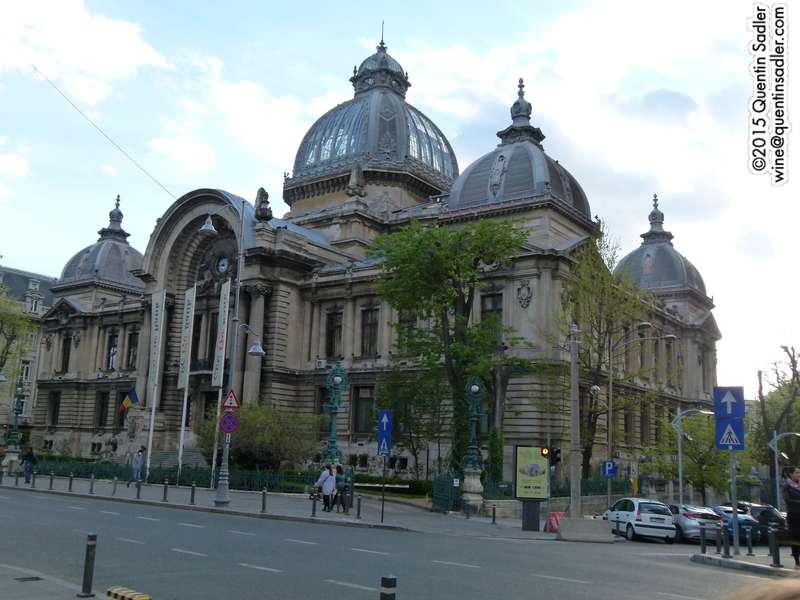 I know it is what most people have heard of in Bucharest, but I could see nothing impressive about it apart from its size and wish Bucharest was known instead for all the other, much nicer things that I saw later. When you realise that a whole section of the old city was demolished to make way for this eyesore it is especially sad that the Romanians have been lumbered with a hideous building on such a scale. Downtown Bucharest, it wasn’t known as the Paris of the east for nothing. Later we strolled through Bucharest on our way to a restaurant for dinner and so were able to take in some of the sites of the old city. Parcul Cișmigiu (Cișmigiu Gardens) is a delightful city centre park complete with boating lake and a rather attractive looking café. 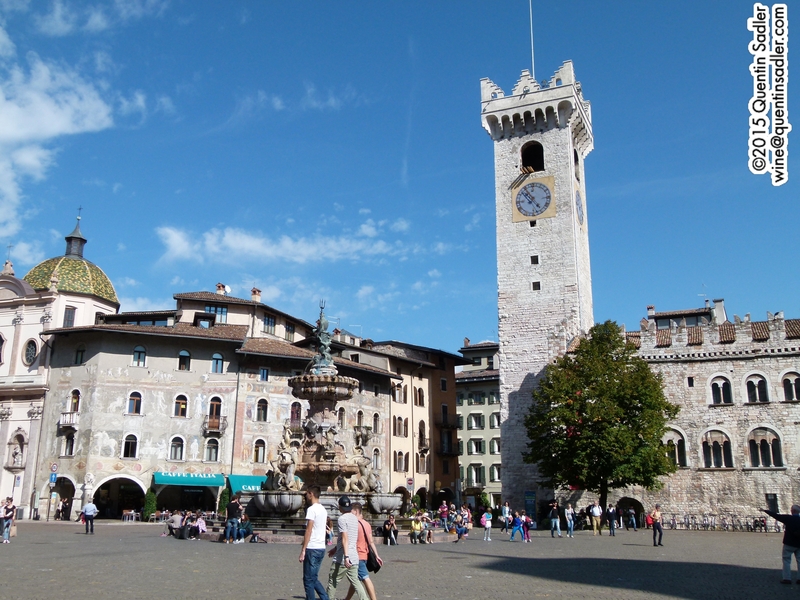 There are run down areas too, but the old city centre is a delight of winding lanes and restaurant lined cobbled streets. 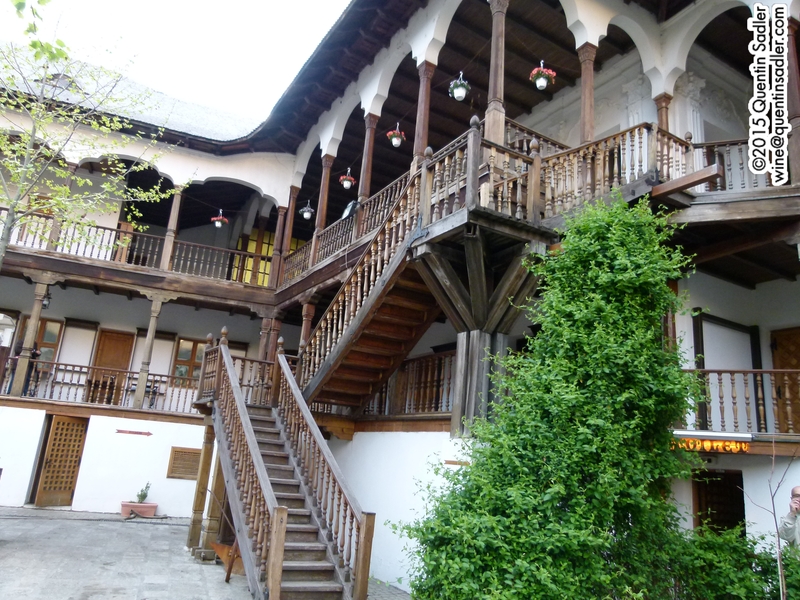 A real highlight is the Hanul lui Manuc (Manuc’s Inn) which is a beautiful Ottoman inn that was built in 1808 – Romania was a part of the Ottoman Empire until 1878. The amazing Manuc’s Inn (Romanian: Hanul lui Manuc, an Ottoman inn and market complex dating from 1808. 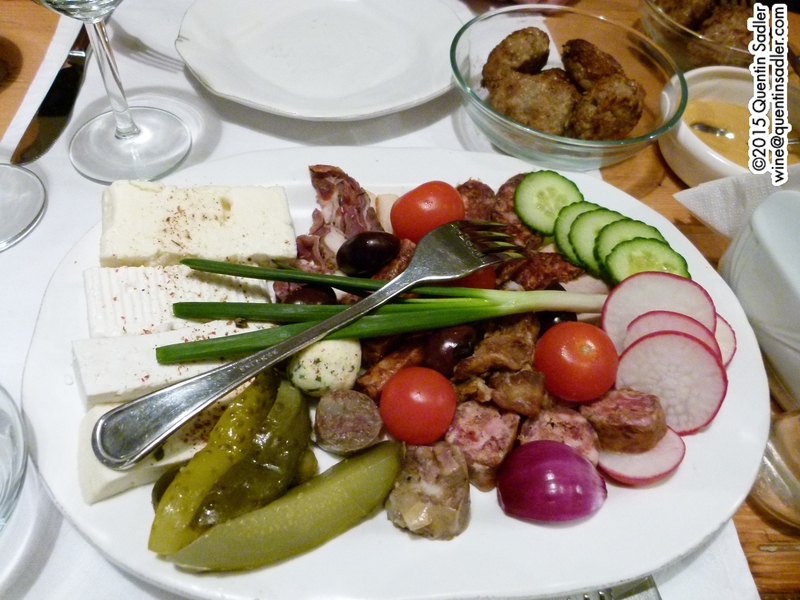 The dinner at the Lacrimi si Sfinti restaurant was very good, traditional Romainan food, with starters of Telemea cheese, salată de icre (taramasalata made of carp roe – carp is rather wonderfully called crap in Romanian! 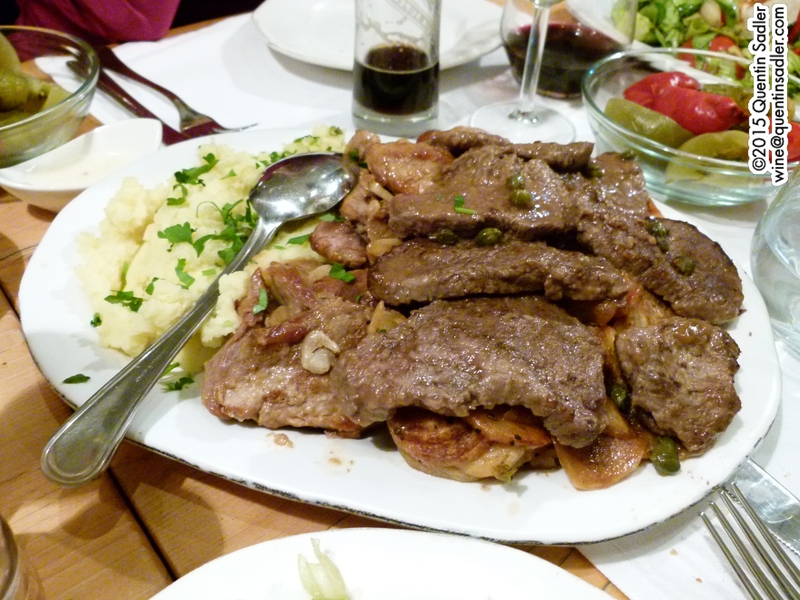 ), alată de vinete (smoked and roast aubergine dip), pârjoale (meatballs) and all manner of sausage, followed by lots of meat, potatoes and polenta, all washed down with local black beer and wine. We rounded off the evening with steins of rather good beer in the Caru’ cu Bere. This is a vast, beautiful, Germanic beer hall that was founded in 1879, so is as old as Romania itself. Touristy it might be, but it was great fun. One thing that makes Romania a good country to visit is that because the people are not Slavs, Romanian – as its name implies – is a Romance language and it has much in common with Spanish, French, Italian and Catalan. In truth I found it much easier to make sense of it when written down rather than spoken, but that means that most of us wine types can read the shop signs and the wine labels without too much effort. Take a look at the map, I don’t think I could do that in any of the neighbouring countries! The next morning we headed off to the Dealu Mare region some 40 km north of Bucharest. S.E.R.V.E. 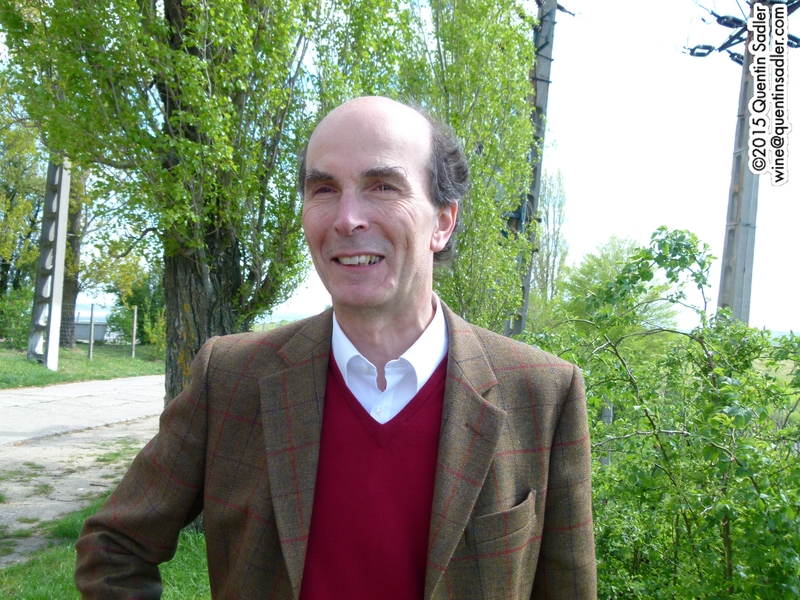 (which stands for The European-Romanian Society for Exquisite Wines) was founded in 1994 by Frenchman Guy Tyrel de Poix. Sadly he died in 2011, but Mihaela Tyrel de Poix, his charming Romanian wife, has kept the winery going from strength to strength. 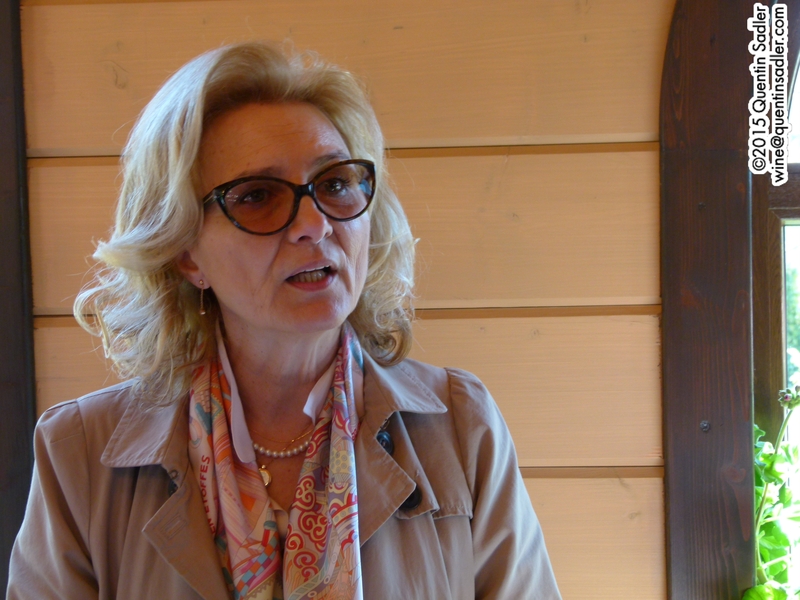 Mihaela Tyrel de Poix CEO of SERVE. Most of their 142 hectares grow in the Dealu Mare region, but they also farm 42 hectares in Babadag near the Black Sea. Standing in the vineyards was quite an experience, they are on south facing slopes and although they don’t look high we had wound up and up from the valley floor and the cool wind was blowing directly onto us and the vines. It was interesting standing up there looking around at the vines. Just as we had seen elsewhere, there were as many rubbed out and derelict vineyards as tended ones. This is for two reasons, firstly the rules for accession to the EU mean that all the hardy, productive hybrids have to be grubbed up by 2014 and secondly with the former mass market of the Soviet Union just a distant memory, quality not quantity is the way forward. 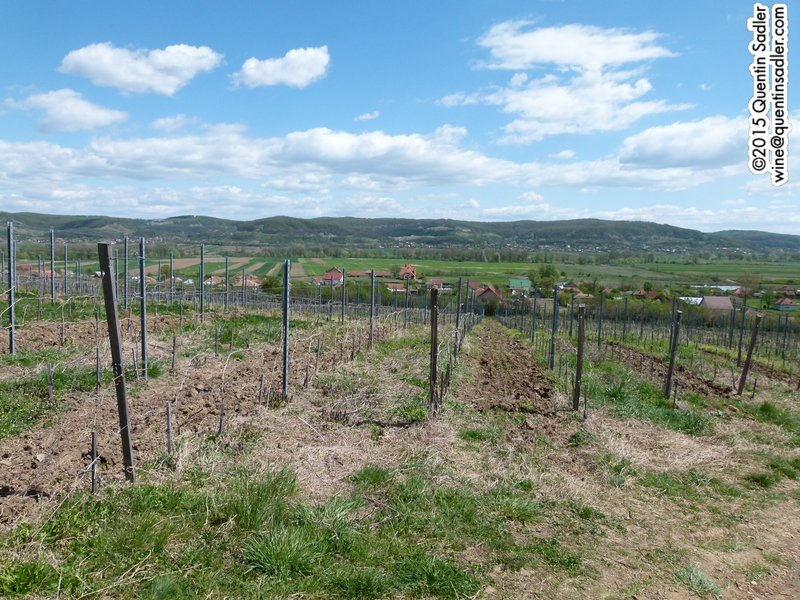 So fewer vineyards, but on better sites and using better clones is the way Romania is going – and it shows. S.E.R.V.E. produce two ranges, the entry level Vinul Cavalerului wines which sell chiefly on the Romanian market and the premium Terra Romana. Both were good, in fact I think the Vinul Cavalerului Pinot Noir, Riesling and Fetească Neagră were the best everyday wines I tasted on the trip. The premium wines were good too. I especially enjoyed the the lees aged Terra Romana Fetească Albă (White Maiden) with a delicately creamy palate and citric acidity and the Terre Romana Cuvée Guy de Poix, which is a very fine Fetească Neagră that feels a little like Grenache, but more tannic. Some of their wines are available in Calais. Our final winery visit was to Halewood, whose importance cannot be underestimated. John Halewood was a well known wine trade figure in my youth, he created his company in 1978 and in 1987 started importing Romanian wines into the UK. It was a very successful venture and Halewood was for a long time the major name in Romanian wine. So much so that within ten years of that start they had created a Romanian subsidiary and were making their own wines for export. 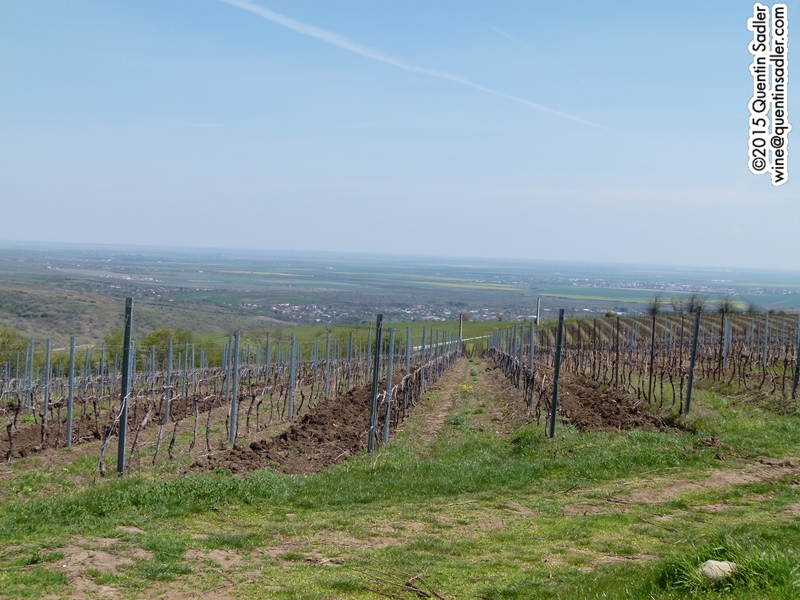 Today they have vineyards in Dealul Mare, Transylvania and near the Black Sea in Murfatlar. Lorena Deaconu (left) Senior Winemaker at Halewood and Diana Niculescu (right) Export Manager at Halewood. In Dealul Mare they have a lovely manor house where we tasted a huge part of their massive range together with Lorena Deaconu, their bubbly and modest senior winemaker. All the wines were clean and sound and are widely available at very good prices, for instance these from Waitrose and this single vineyard Pinot Noir from The Wine Society. Lorena was very keen to show us her premium wines though and this is where the excitement was to be found. Their Neptunus Shiraz and Hyperion Cabernet were particularly impressive, but are sadly not yet available in the UK. A few years ago Halewood also bought Rhein and Cie, which is a specialist sparkling wine producer based in the small ski resort of Azuga in the the Carpathian Mountains. This is where we went next and it was a fitting finale to our trip. Rhein and Cie were founded in 1892 by a German called Rhein and have always focussed on making traditional method fizz, indeed the wonderful old posters they have in their museum call it Şampania Rhein! Remuage still carried out the old fashioned was at Rhein & Co, part of Halewood. Disgorging still carried out the old fashioned way at Rhein & Co. The base wine is produced by Lorena at Halewood and then brought up to Azuga for the second fermentation, remuage and disgorging, all of which is done by hand. It is a beautiful winery, nestling in the snow covered mountains, so the whole experience was quite magical. The wines were impressive too, especially the Rhein & Cie Brut Rosé which is made from Pinot Noir grown in the Sebeș Alba / Alba Iulia region of Transylvania. Azuga, Prahova a ski reswort where Rhein & Co are based and we spent out last night in Romania. 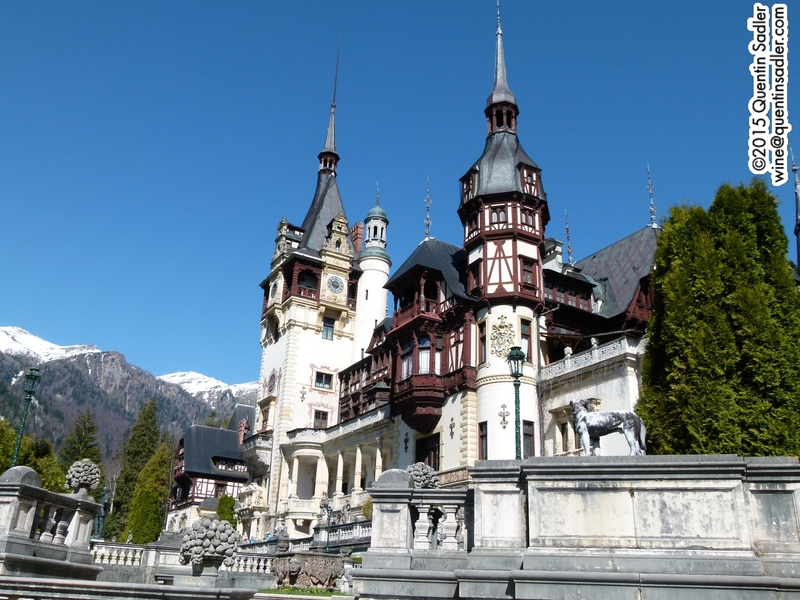 The magnificent Peleș Castle near Azuga in the Carpathian Mountains. I loved this trip. 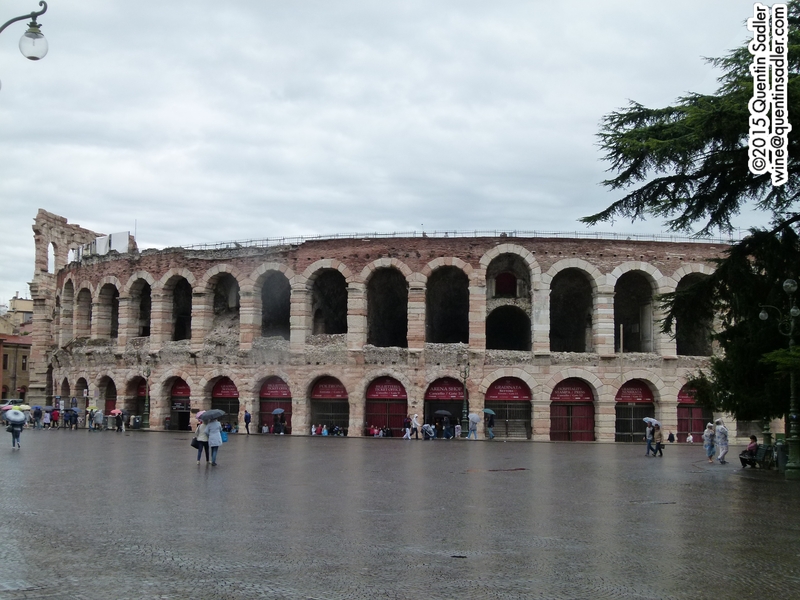 Everything was excellent and I experienced many new things and saw some wonderful sights. The wines exceeded all my hopes, let alone my expectations. I didn’t taste anything that was bad and only a few wines that were not to my taste. In truth I have still not tasted enough or travelled widely enough in Romania to really get to grips with the differences between the regions and I realise that I only scratched the surface of what is available, but on this showing Romanian wine has a very bright future.